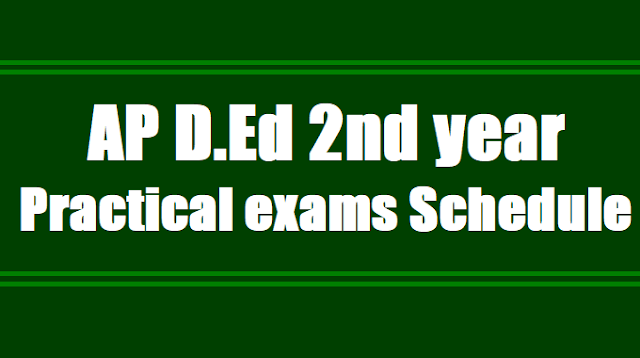 AP D.Ed 2nd year Practical exams Schedule/Dates 2017, AP D.Ed II year Practical Exams dates: SCERT AP, Rc. No.86 /A/TE/SCERT/2017-1 Dated: 30-8-2017:: Sub: SCERT, Andhra Pradesh, Amaravati - D.El.Ed. 2nd Year Practical Examinations for the year 2015-17 batch - Conduct of Final Practical Examinations to 2nd Year Trainees of Govt. and Pvt. D.El.Ed. Colleges - Communicating of Practical Schedule - Issued - Reg. Ref: 1. G.O.Ms.No. I, dated 01-01-2016 of School Education (Prog-IJ) Dept. 2. Re. No. 04/C2/2017, dated 19-8-2017 from Director, Govt. Examinations, Andhra Pradesh, Hyderabad. All the Principals of DIETs are requested to conduct the 2nd Year D.El.Ed. Practical Examinations to the 2nd Year Trainees of Govt. and Pvt. D.El.Ed. Colleges in their respective districts. The guidelines are to be followed are here with enclosed. All the Principals of DIETs are requested to conduct a meeting with the all faculty members of Private D.El.Ed. Colleges and appraise about the conduct of Practical Examination. Further, he I she is also requested to record the attendance of the faculty members. In case of any discrepancy the Principals, DIET is requested to report the same to the Director, SCERT, Andhra Pradesh Amaravati. 1. Pedagogy of English (2 lessons) - One from 1-2 classes and one from 3-5 classes. The DIET Principals are informed that external examiners are not appointed for optional pedagogy practical examinations due to not availability of students particular in optional subjects. Hence, they are requested to appoint external examiners from the Pvt. Colleges depending on the number of students opted optional subjects. (Data may be obtained from colleges). The budget is being released by Director, Govt. Examinations, Andhra Pradesh, Hyderabad for conduct practicals. 3. The duration of practical examination is 5 days for each institution. Govt. DIETS and Private colleges where the in-tack capacity is 100 Candidates, the principals of DIETS are required to appoint one more External examiner for each subject from the private colleges where such subjects teacher educator are available. 4. Each Institute (College) shall be allotted to l Primary school/upper primary school. 5. Same batch of trainees will continue in the same school which is allotted for them for final practical examinations till completion. 6. Internal Examiner will be the faculty member of the same Institution and External Examiners will be the member allotted as given in the schedule. 7. In case any internal or external examiner does not report, the principal of the DIET of the respective district shall make alternative arrangements with due intimation to Director, SCERT. 8. The final practical marks shall be sent to O/o Director of Government Examinations, A.P., Chapel Road, Hyderabad, immediately after completion of the exercise. 9. Principal, DIET shall conduct a meeting with Principals and faculty members of all private D.El.Ed colleges to appraise about the conduct of Practical examination. l 0. Principal, DIET shall record the attendance of the faculty members of the college and copy of attendance shall submit to the Director, SCERT. 11. The Principals of DIET are requested to issue instructions to record the mark in the central mark register and the same is applied for other records. 12. The final practical should be conducted in Pedagogy of English, Pedagogy of EVS and Pedagogy of Optional. In case, in English to conduct 2 final practical lessons one from class l and 2 & one from class 3-5. Regarding the Pedagogy of EVS to conduct one practical examination from classes 3 - 5 and Optional Pedagogy examination from classes 6 - 8. 13. Conduct Assessment of Value Education and Life Skills, Work Education and Yoga, Health and Physical Education with the help of internal teacher educator. 14. Due to non availability of students data regarding optional pedagogy subjects the external examiners are not appointed. Hence, the DIET Principals are to collect the data from the Pvt. Colleges, accordingly appoint optional pedagogy external examiner. 15. If duration of 5 days is not sufficient for practical examination the Principal DIET can extend one or two days. 16. Practical exam Marks: Each Practical examination has to conduct for 20 Marks. Note: 1. The Principal DIET, Bommuru, East Godavari is requested to conduct Practical Examination for Pvt. College at Yanam. 2. As the Summative examinations are going on in the second spell, negotiate with the schools and conduct practical examination in the afternoon session/as per the convenience. 3. Estimated budget may be submitted to Director, Govt. Examinations for release of funds and extend the same copy to the Director, SCERT to follow up the action.